Although I’m obsessive about planning flights, trains, and hotels, once we’ve arrived, as far as possible, we allow serendipity to rule our holidays. Unexpected discoveries are always the best. So it was with our arrival in Vienna this month. Just before our flight took off, I scanned Google Maps to see what sites might be worth visiting within walking distance of our hotel, and that’s how I found the Hofmobiliendepot or, in English, the Imperial Furniture Collection. As Judith is a retired furniture restorer, this was a no-brainer. But I wasn’t expecting one of the most enthralling, and ultimately moving, museums we’ve ever visited. Surprise number one was the fact that, of the numerous Habsburg palaces across the middle of Europe, only the Hofburg in Vienna was permanently furnished. All the rest were equipped as and when needed from the furnishings kept in the Hofmobiliendepot.Visits by the Emperor and members of his family and court would be preceded by convoys of up to 100 carts, carrying everything from wardrobes to candelabra, from beds to mirrors. So, the first part of this fascinating museum told this story, and gave a vivid impression of what the store must have been like in its heyday (and if the prospect of twenty different designs of spittoon case doesn’t intrigue you, perhaps this part of the collection isn’t for you!). But it then moved quickly into a different gear, with a series of displays of items related directly to the lives and surroundings of individual Habsburgs. The story of Franz Joseph 1, longest-reigning Habsburg Emperor, and third-longest reigning monarch in European history, is one of a succession of hammer-blow tragedies. His brother Maximillian embarked on an abortive project as Emperor of Mexico and was executed by Republicans. His son Rudolf committed suicide in the scandal known as ‘Mayerling’. His beloved Empress Elizabeth, known to all as Sisi, was stabbed to death by an anarchist. The shooting of his nephew, and heir presumptive, Franz Ferdinand, triggered the First World War, and the dissolution of the Empire that Franz Joseph had spent his long life trying to preserve. It’s impossible to stand before the objects and furnishings that these people used on a daily basis, and not be moved by the associations. For Austrians, of course, those associations are very much more powerful, but not for purely historical reasons. There can hardly be a single Austrian alive today who has not been exposed to the trilogy of ‘Sissi’ films made in the 1950s, and an annual Christmas feature on Austrian television to this day. Romy Schneider, herself a deeply tragic figure, launched her career playing the Empress ‘Sissi’ (note the extra ‘s’, a nod to those typical movie disclaimers that ‘any resemblance to individuals living or dead is purely coincidental’), and most commentators date the cult of the real-life ‘Sisi’ (with one ‘s’) to the advent of those films. This is directly relevant to the Hofmobiliendepot. The film-makers couldn’t always get access to palaces like Schönbrunn, which otherwise had to be recreated in the studio, but they could borrow furniture and props from the Hofmobiliendepot, and clever displays in the museum show the actual pieces alongside clips from the films in which they were used to create a sense of ‘authenticity’. So when Austrian visitors now view these objects in the Museum, are they being moved more by the associations with their original users, or by the memories of their appearances in the films that they’ve known since their childhoods? The Hofmobiliendepot is not averse to tugging the heartstrings directly. There is an extraordinary shrine to Maximillian, built around the coffin in which his body was brought back to Vienna from Mexico, which is guarded by the elaborate helmets and swords of his Imperial Guard, and accompanied by his own stylish white sombrero—just what he is shown wearing in the reproduction of the famous Manet painting of the execution displayed behind the coffin. And here my own reactions are equally complicated: Maximillian is a leading character, played with great conviction by George Macready, in one of my own favourite films, Robert Aldrich’s Vera Cruz. The serendipity effect continued on our second day in Vienna. Enjoying our favourite holiday roles as flaneurs (not entirely aimless wandering of city streets), we found ourselves close to the Kapuzinergruft, the Capuchin Crypt, in which most of the Habsburgs were buried from 1632 onwards. Actually, ‘buried’ is not quite the term, as the various monarchs and their relatives are entombed in individual sarcophagi, some unbelievably elaborate (the lid alone of that of Maria Theresa and her husband weighs 1700 kilos), others austerely plain (starting with that of Maria Theresa’s son Joseph II, he of the famous ‘Too many notes, Herr Mozart’ quote). On previous trips to Vienna I had shied away from this ‘visitor attraction’, expecting it to be rather kitsch and touristy (like all those bewigged touts trying to sell concert tickets at every major tourist site). I could not have been more wrong. The Kapuzinergruft is resolutely low key, under-stated, and defiantly anti-tourist. Without a decent knowledge of Habsburg history, or a good guide, the visitor will get little more than a mild frisson from these serried ranks of tombs: 107 separate sarcophagi including 12 emperors and 18 empresses. The climax is the second-to-last room dedicated solely to Franz Joseph, his murdered wife, and his suicidal son. We found this space, and its simple austerity, almost unbearably moving: the weight of history, so to speak, was pressing on us. And on many other visitors, it seemed, as there was a plethora of small and touching tributes at the feet of the coffins, from flowers to children’s drawings. I’ve never been to Queen Victoria’s tomb at Frogmore, but I don’t imagine it receives similar spontaneous tributes. But what, exactly, are these tributes to? To the memory of one of the last Imperial dynasties of Europe, and an empire that, by its end, had become impossibly sclerotic (read Joseph Roth’s The Radetsky March! ), or to the characters made familiar by those endlessly repeated ‘Sissi’ films? 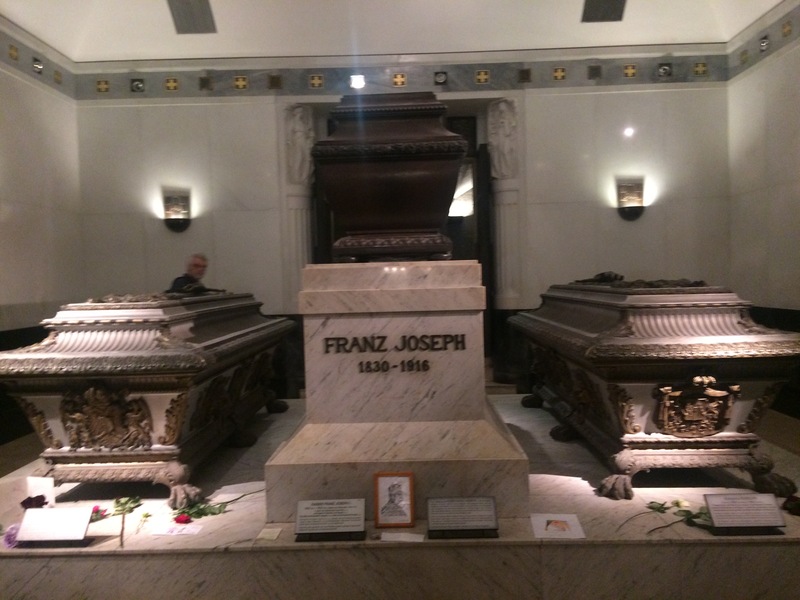 And I couldn’t avoid one sneaking, and impertinent, suspicion: could we really take it on trust that the actual bodies were resting in these imposing sarcophagi? After all, forensic investigations had just disproved the long-held belief that The Old Fox, Lord Lovat, was buried in the crypt of the mausoleum in the village where we live! I was reminded of the wonderful sculptures of Harris-based artist Steve Dilworth. He makes beautifully fashioned objects that purport to contain eggs, bird skeletons, even Hebridean air! When asked for proof that one of his sculptures did in fact contain a bird, he replied ‘Destroy it, and see!’. With Dilworth’s sculptures, as with the Kapuzinergruft our reactions have to be rooted in a trust in others, not in any objective proof—and of course, in our own willingness to believe.